After making a slide, click “Insert” then “Shapes” and choose an appropriate shape. That is how you make a “button.” You can add text directly into the button to have students make a choice as to their next move. One you have made a button, you have to activate it! For this, you have to create a link to another page in the presentation. If you are starting from scratch, you need to make another slide before doing this! directly to the slide it will always head to the correct slide. Even if the slide number changes! Once I’ve created my path, I add in a generic “Wrong Way” slides. The reason for this is that unlike PowerPoint, Google Slides does not let you turn of the “Space Bar” or swipe/click to the next slide function. Having this cues students in that they are in the wrong place and they have to swipe back. 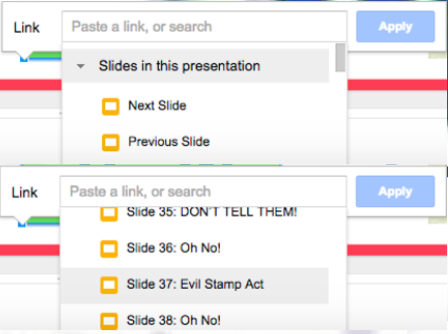 On another presentation where there were four distinct tracks, I color coded the paths. As this simply had one major throughway, I did not do that. The last and most important tip when making these is that you need to test it out and plan that students may falter at first! For this, I had another teacher play through it and then talked with my substitute about the issues that students may run into. When I did return to my class, one of my students apparently had served as a troubleshooter for some students. I get really geeked out for this kind of stuff. My ultimate dream would be to spend more time working on interactive history. Here is a link to a presentation on the Political Parties of the Weimar Republic that I used this technology (and TodaysMeet for a class interactive activity). This entry was posted in History and tagged 1:1, 21st Century, American Revolution, Social Studies, Technology. Bookmark the permalink.